Putting us back on the track of staying classy, the fourth book suggestion was a New York Times bestseller that I had never heard of (I actually don't know any New York Times bestsellers since I don't follow that list, so that aside was kind of redundant). This book put me back in favour with my baking guinea pig (who, with the last book, used her facial expression to disown me). When I told her about it, she became very excited, which in turn lifted my expectations for the book. Although when your expectations are lacking, the only way for them to go is up. She said she really enjoyed reading that book when it came out, and was good enough to find her copy of it so I could borrow it from her. When I finally got a copy of the book I dove right into it and... it took me a while to get used to it. It reminded me of those first 10 or 15 minutes of watching a Shakesperean play when your brain has to spend time getting used to the way the actors are talking because it's English but not as we know it Jim. I got that same vibe from this book in the first chapters. It's written in modern day English, so it wasn't a centuries-of-language-evolution problem. I think it might have been because I'm not used to reading books that aren't some kind of science fiction / fantasy, and many of the books I've read in that genre have this style that I'm just so used to that anything else is slightly jarring. That's not to say that this book was badly written. 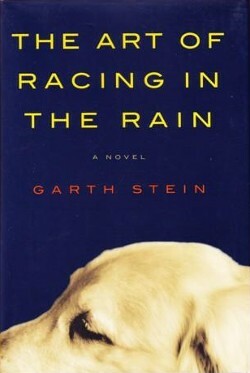 It was very well written, especially since it's all told from the perspective of a dog. The Art of Racing in the Rain is a book about a racing car driver, Denny Swift, and his life journey as he seeks success in his family life, his racing life, and to maintain a balance between the two, which are often at opposition. All of this is told through the eyes of his dog, Enzo. It's a first-person (dog?) story, so we only go wherever Enzo goes, except on the occasion when Enzo embellishes which he has to do sometimes since he's not privy to everything that takes place in Denny's life. He often says when that happens, and when I think back on it I believe Enzo said it was for the sake of keeping things interesting, which is a good trait for a narrator, and even better one for a book, and a remarkably strange one for a dog. It kept coming up, the 'this is a dog' thing, because Enzo comes across as so remarkably human - quoting metaphors and aphorisms about racing and life - that I kept having to check myself whenever I started imagining Enzo's perspective shifting to human eye level. That's probably only a problem with me because following a narrator who's sometimes invisible yet always there is reminiscent of the way I dream. Often I can't tell whether I was a disembodied version of me following myself, or just myself, as the perspective often shifts from first- to third-person perspectives. If you've ever thought of a dog's actions as silly, then this book will make everything a dog ever did surprisingly justifiable. By experiencing the story through his eyes, you sympathize with his actions, and I often found myself nodding in total agreement to Enzo peeing all over the floor. "Yep, I'd do that too in that situation." I would think. Suddenly, barking at certain things or people, or running around excitedly at a park seem normal to me, and I find myself thinking back on Enzo's motivations whenever I'm walking around and see a dog doing those things. I've ranted on and on about the dog, because it really is what makes this book great. The story, without Enzo's perspective, would be like any other fiction story on the shelf of your library, and probably just as forgettable. Enzo is what really sells this book, and what kept me glued to its pages for the 2 weeks of my free time that it took for me to finish reading it. I was a bit sad when I reached the last page - sad at it being all over - and hopeful given the way it all turned out. I returned the book to it's owner and remained a bit quieter for the remainder of the day, not just because the ending had left me solemn, but also because I was emulating what was seen by others in the book as one of Enzo's best traits - his silence. He was never able to say a word to those around him, yet it got others to open up to him and really primed him for listening. Funny that it took a dog to remind me of the many more ways to be a human.